There’s no doubt that contacting 811 to have pipelines and utilities located prior to digging or drilling is the most important step a contractor or homeowner can take to ensure project safety. According to 2015 statistics compiled by the Common Ground Alliance, a utility line is damaged every six minutes across the United States. The statistics also revealed that 31 percent of these damages are caused by insufficient notification practices (not contacting 811 prior to breaking ground). However, this is not the leading cause of utility damage: 45 percent of damages are in fact caused by insufficient excavation practices such as failing to maintain clearances while using power equipment, not using hand tools where required or allowing field markings to become deteriorated prior to excavation. There’s no doubt that contacting 811 to have pipelines and utilities located prior to digging or drilling is the most important step a contractor or homeowner can take to ensure project safety. However, committing to damage prevention extends far beyond Call Before You Dig. There are vital subsequent steps that need to be taken to ensure safety on an excavation project. Technically, you’re required to contact 811 at least 48 hours before work is scheduled to begin. As a best practice, try to call at least five days ahead to ensure enough time and avoid project delays. Keep in mind that the one call system does not cover utilities located on private property. This can include power and communications cable and water/sewer lines serving educational or government buildings. Where possible, white-line the boundaries of your project site prior to having locates performed. This involves pre-marking your dig or drill site with white paint, flags, stakes or a combination in order to accurately communicate the boundaries of excavation to both the locate service provider and facility owners. Make sure you receive a complete locate package for all utilities within your project site before proceeding with construction works. All utilities present on the site should be marked with spray paint, flags or both, and you should be provided with documentation confirming completion. Take time to read and understand the locate documentation. Protect field markings and sweep away any dirt that may be covering them. Once utilities are located and marked on your project site, there are a few best practices to keep in mind. The excavator should carefully hand dig around the marks to the depth of the excavation. Never dig directly on top of the marks as this is always an unsafe practice. Even minor inaccuracies or discrepancies in depth data could create a dangerous situation. Be sure to limit excavation to the area covered by the utility locate request. If the limits of the project site change, submit an additional locate request through 811. For many utilities, ground marks are considered valid for one month, after which time they should be repainted. Be sure to check the expiration date of your marks, which you can find on the locate ticket. It’s also a good idea to become familiar with spray paint color coding so that you understand what type of utilities are buried on your project site. Utility damages have been known to occur even when the utility has been accurately located, the work area has been marked and the marks are valid. How does this happen? Often it comes down to relying on assumptions. 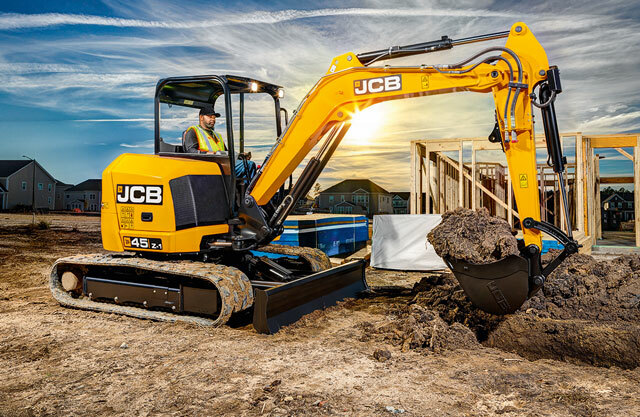 Assumptions about the depth of buried utilities can create a dangerous situation; an excavator digs down a few feet and when nothing is detected, continues to drill until contact is made. If depth data is required, it may be necessary to perform test pits as part of the utility locating process. It’s important to have a general understanding of locating technology so that you’ll know which one to apply to your specific project. 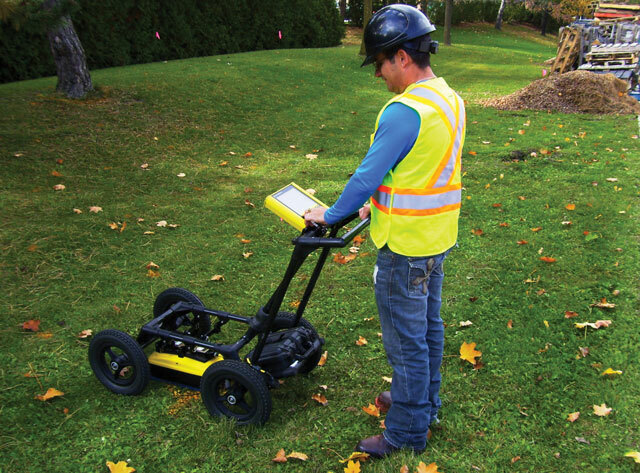 GPR, pictured here, is ideal for locating non-conductive buried assets such as clay and PVC pipes. It’s important to have a general understanding of locating processes and technology so that you’ll know what is required for your particular project. With the wide variety of lines that run underground — power, communications, gas, sewer, water, etc., different detection techniques are often required for different types of buried lines. For instance, metal cables and pipes can be detected using standard electromagnetic (EM) induction techniques, whereas non-metallic utilities such as clay or plastic pipes, require additional techniques such as ground penetrating radar (GPR). EM is a common locating tool that operates by sensing either a background signal or a signal introduced into a conductive utility line using a transmitter. In order for this technique to work effectively, the utility must be comprised of a conductive material, such as a metal pipe or cable. GPR is a non-destructive geophysical tool that transmits high frequency radio waves into the ground and analyzes the reflected energy to create a profile of the subsurface features. It is extremely effective at locating buried non-conductive linear infrastructure such as PVC pipes, concrete sewers and other utilities. An additional advantage lies in the fact that a direct connection is not required to discern utilities and other underground features. Working with a qualified locate service provider is key to reducing risk, ensuring accuracy and transferring liability. Ask a few key questions of the service provider that will be locating utilities within your project site to ensure they are properly qualified. For example, what is the training program in place for field technicians? Does the company abide by a health and safety policy? What is the quality management process? Does the service provider have experience successfully completing projects of a similar size and scope? What level of accuracy can be expected? Is there a damage investigation process in place? Working with a qualified service provider will greatly reduce your level of risk. Damage prevention is a shared effort, and there are often many stakeholders involved, so communication plays a big role in ensuring safety. Make sure that everyone on your project team is briefed on the 811 process. When placing your locate request, be sure to provide 811 with as much information as possible. For example, the contact information of the person that will be excavating, when and where this will occur, the maximum depth of excavation and the method of excavation. Always follow up on the status of your locate request prior to proceeding with the work, and be sure to communicate the status to your team. Locate status requests can be checked online through call811.com. Kevin Vine is the president of multiVIEW Locates Inc., a utility locating company with almost 30 years of experience in private and public utility locating, concrete scanning, vacuum excavation, CCTV camera sewer inspection and subsurface utility engineering.